Michelangelo Merisi, Portrait of Fra Antonio Martelli, 1608, 47″ x 36.5″, Oil on Canvas, Palazzo Pitti. Grand, isn’t he? Well, maybe not so much the man depicted, I mean, he looks like a slyly dangerous douche to me. But the vision of the depicted, the visual opulence in this painting, is stunning. Look at the way the light illuminates certain defining moments in his pose – the hand at the belt delicately holding the prayer beads, the other hand deftly adjusts the sword so it can be easily drawn. His forehead is lined and his eyes are set deep. His gaze is weary. He’s a man of experience. His right ear has been made specific, perfectly realized, cocked and listening to everything in this particular room. 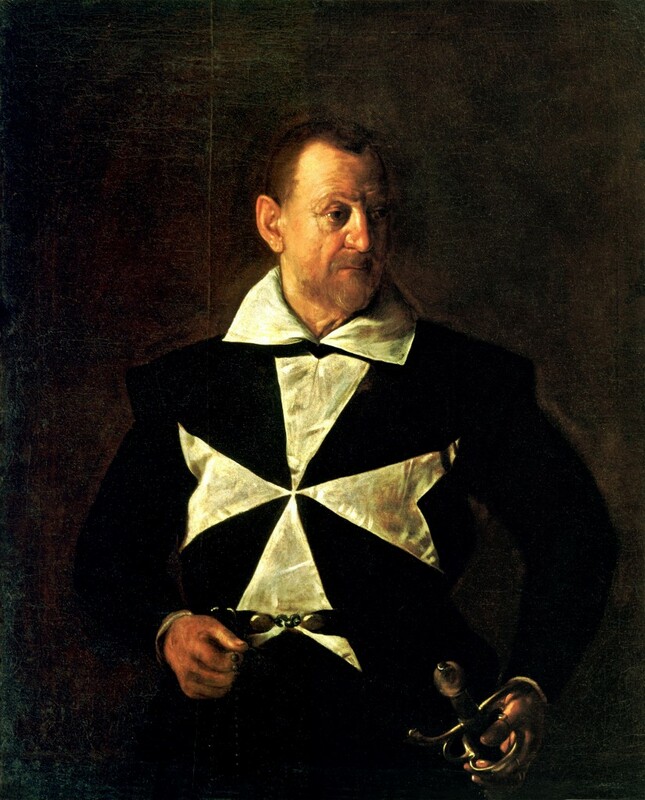 The silk collar and cross on his chest fill out the man’s volume. It makes him solid and thick in all of that blackness. Fra Martelli emerges into our gaze, fills the space before us. He’s an emissary of god, a judge of men, a protector of the church, a Knight of St. John, and if need be, an executioner. This man is ready to act both in thought and deed against those who trespass against Holy Mother Church and the Papacy – heretics, blasphemers, sodomites and murderers. Unfortunately, the artist who painted this picture, Caravaggio, had been charged with all of these crimes. And he was on the run from a well armed band of bounty hunters looking to take his head. Yes, Michele was a wanted criminal, but he also happened to be the Roman art world’s hottest painter of the moment, a controversial avant-gardist and the premier imagist of the new century. Collectors, punters and the church had been lining up to be involved with this art star. There were lists for chapel commissions, decadent parties, FU money, and glamorous success. All had been going really well for our hero right until the moment he managed to murder a crappy swordsman named Tomassoni in a back alley fight over a bad bet, a “bad” woman and some bad blood. That violent encounter fueled by misguided machismo changed everything in an instant, and it sent Michele on a sweaty runner to the South of Italy. Lucky for him there were powerful Roman wheelers and dealers working on his behalf, and by using their connections and back-alley associates they had managed to cobble together a trade that would lead Michele to redemption in Malta. For the Knights Caravaggio would become their court painter and make them famous. He would also swear allegiance to the Cross and the Brotherhood. In return he would be titled as a Knight and find protection from the assassins and bounty hunters that were hot on his tail. As a bonus if he could keep himself together and out of trouble a Papal pardon would be given for his capital crimes back in Rome. And with that pardon “Fra Michele Merisi” could find his way back to the Piazza Navona and back to the life of privilege that he had thrown away so carelessly. His sins would be forgiven. In Italy this kind of deal making is called “l’arte di arrangiarsi”. Arrangiarsi is all about stretching the rules and finding a solution to a difficult problem – find a clever way to get around a tight situation – and in this case the “deal” would get the troubled genius back to work for the Church. But this particular deal hung on one really shaky proviso – that our troubled hero would tow the line, keep it in his pants and show a bit of contrition. Strange, though. The last few “lost” paintings, the ones Michele had “left” aboard his hired felucca before his retched death, managed to wind up in the “right” Roman collections. Arrangiarsi indeed. Like so many places in Italy the city of Firenze is a living museum. Millions of us pony up every year to indulge in the beauties of the past. We marvel at how many of the works in their galleries and churches can still move us, enthrall us, fill us with vision and emotion even though these works were made hundreds of years ago. It’s comforting to know that there is a human constant, a human connection in our visions. But because we are just tourists we march through these things like we are on treadmills – moving from one sight to another, pushed along by the crowd behind, all of us wanting to see the same things, experience the same things in our own publicly produced private moments. But these things that we encounter are never quite what they once were as marvelous as they might seem. They are the past, they are memories. We tend to fetishize these moments, polish them for consumption, mark our tourist’s moments through them. We’ll take photos of the famous things, meander to the next and the next, leaving them on the walls where we found them. We prefer to see these things through the postcards in our pockets, the catalogues in our bags or the moments captured in our photo streams. But strangely, once in a great while, some thing that we’ve seen sees us as well and follows us back to our hotel rooms. The thing becomes… present. And before we know it this present thing has slyly insinuated itself into our lives. On that day Fra Martelli came along with me and has been with me ever since, a bothersome last “gift” from Michele. 2 am and all I can think about is that vision can be a supremely dangerous thing. I wrote in my sketch diary – “It’s not the things we know we’ve seen or the things we expect to see that takes us. It’s the things that surprise us, the things we think we do not want to see, things we see that we can not or will not understand, the visions that persist, that are and will remain for each of us, unrelenting.” And I have come to understand that this is life making itself known in no uncertain terms through vision. These bothersome things are raw, unfocused and they exist without our permission or our influence, without our taste or our preferences. They see straight through us. They can not be conjured up in series or made through technologies or experienced without consequences. They do not maintain their distance. They are dangerous, and these visions change how we see the world. Today there are expeditions looking for the bones of Caravaggio amongst the catacombs of Porto Ercole. They conduct tests in labs looking for DNA markers and genetic sequences hoping to prove that his remains rest among the other poor souls dumped into these nameless pits. And by doing so they may resurrect him, make him one of us once again. We painters are also doing these same kinds of things, conducting the same kinds of tests, looking for markers and sequences among the bones of a dead Modernism. We search through the artifacts of abstraction – the flat surfaces, the processes and manufactured products, the advertising landscapes and image flows. We look on “pictures of nothing” hoping to find that something may indeed exist there, and we are happy when we find ourselves reflected back on those surfaces. But for me Fra Martelli continues to stand in that dark room, in our room, counting his beads, waiting for us to decide – will we see our fate and change or will we continue on our path as our lost Michele had done so long ago?